Type 1.5 Diabetes (T1.5D) is also known as Latent Autoimmune Diabetes of Adults (LADA). LADA is considered by some experts to be a slowly progressive form of Type 1 Diabetes (T1D) while other experts in the field consider it a separate form of Diabetes. LADA or T1.5D is sometimes thought of as T1D that is diagnosed in adults over the age of 30—T1D is commonly diagnosed in children and younger adults. T1.5D is often found along with Type 2 Diabetes (T2D): up to 25% of individuals with T1.5D also have characteristics of T2D.1 This is sometimes called “double diabetes”. Individuals with T1.5D are all eventually dependent on insulin for treatment, and have a very high risk of requiring insulin within months or years (up to six years) after the initial diagnosis. This is in contrast to people with T1D—these people tend to need insulin within days or weeks of diagnosis.2 Individuals diagnosed with T2D relatively rarely require insulin treatment. Current recommendations are to treat individuals with T1.5D immediately with insulin, though this is not universally accepted (see below). Just as with other forms of diabetes, we don’t truly understand the underlying cause(s) of T1.5D. There are autoimmune components in Types 1, 1.5 and 2 diabetes with some overlap in the types of antibodies formed, so it is clear that as in T1D, the immune system has become “confused” and begins to act against the beta cells of the pancreas—the source of the insulin needed to control blood sugars. Both T1D and T1.5D have antibodies to glutamic acid decarboxylase or anti-GAD antibodies. As with T1D, individuals with T1.5D tend not to be obese, whereas in T2D, most individuals are overweight or obese. The symptoms of T1.5D are similar to the other forms of diabetes—increased frequency of thirst, increased frequency of urination and unintentional weight loss. Other symptoms such as blurriness of vision or fatigue may occur as well. Commonly, T1.5D is initially diagnosed as T2D and the T1.5D is considered only after the failure of treatment with medications to control blood sugar— these are most commonly the sulfonylurea medications that are discussed below, but this treatment failure can be seen with metformin as well. 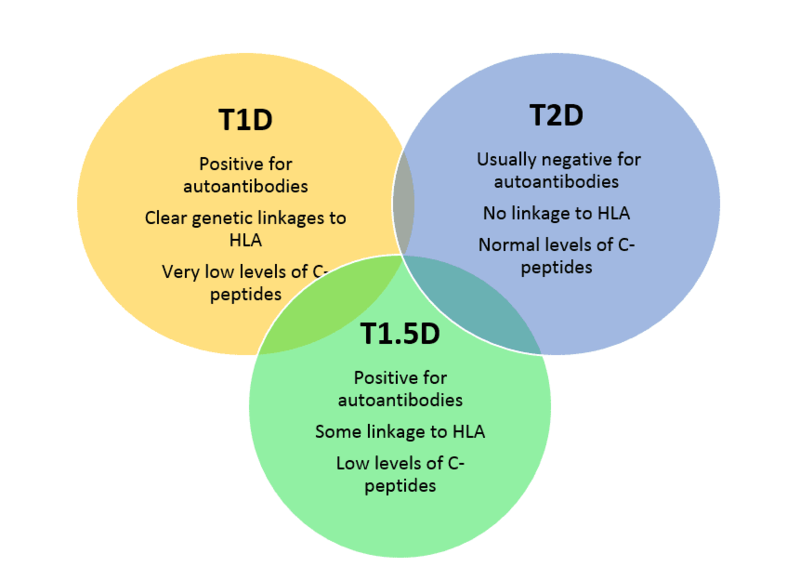 Once these common anti-diabetes medications fail, further testing is done to determine if there are antibodies present and if the level of C-peptide (a normal substance which serves as a biomarker in both T1D and T1.5D) is low. Have not required treatment with insulin within the first 6 months after diagnosis. Individuals with T1.5D have about the same degree of insulin resistance and control of blood sugar as compared to T2D. T1.5D also shows a relatively low level of a biomarker known a C-peptide—this biomarker is becoming more commonly used to distinguish T1.5D and T2D.6 C-peptide is very low in people with T1D, low in people with T1.5D and normal in people with T2D. There is no widespread agreement on how T1D, T1.5D and T2D differ and there is a good deal of overlap in symptoms and in lab results. Treatment of T1.5D is similar to that of T1D—insulin is the “treatment of choice” and should be started as soon as possible even though the current guidelines suggest a 6-month insulin-free period.7 Diet and exercise can be beneficial, with caloric restriction for those individuals who are overweight or obese. It is very important to obtain the correct diagnosis because there are some concerns that certain types of blood sugar lowering drugs—the sulfonylureas such as glimepiride, glyburide and glipizide should potentially be avoided because they stimulate the beta cells of the pancreas—this could result in a greater destruction of these beta cells by the already formed antibodies.8,9 Metformin can be cautiously used, if needed. At least according to some reports, drugs such as sitagliptin and exanatide may be potentially produce the best results for blood sugar control in people diagnosed with T1.5D. As with the other forms of diabetes, those with T1.5D have a higher risk of heart disease, stroke and microvascular complications such as vision, nerve and kidney damage. These risks appear to be decreased the sooner the insulin treatment has begun.